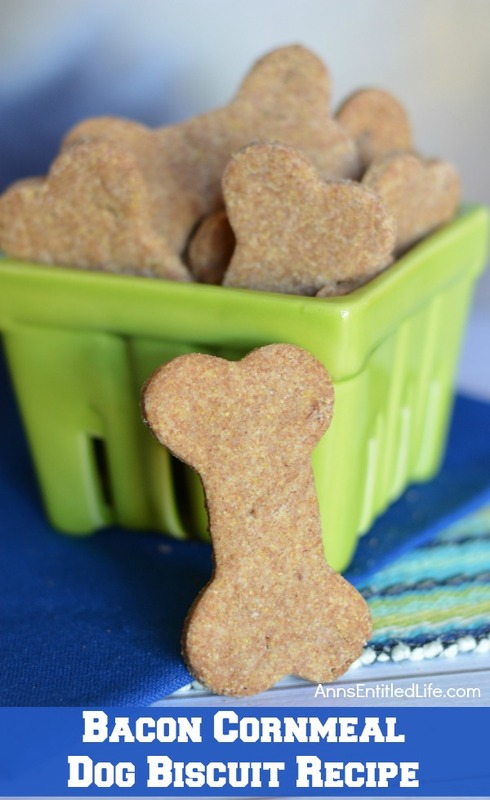 These homemade dog treats for your special pooch are bursting with flavors dogs love. 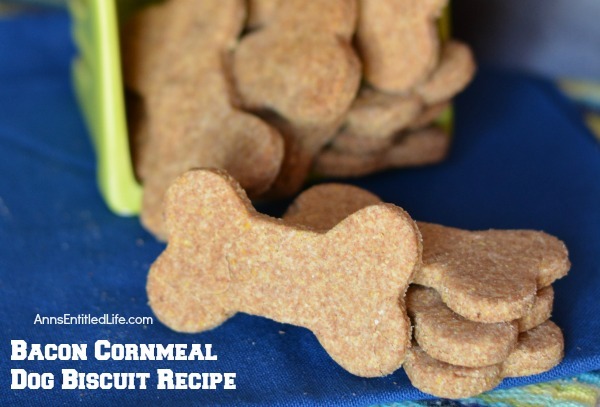 These easy to make bacon cornmeal dog biscuits will have your pet barking for more. • In a bowl, add whole wheat flour and corn meal; mix well. • Add liquefied bacon grease to flour mixture; mix. • Add oil and water beginning with ¼ cup of water. This may be enough, or you may require additional water (up to one cup) added ¼ cup at a time – until the dough forms a ball. • Roll dough onto a floured (with corn meal or whole wheat flour) surface and cut into dog bone shapes with a cookie cutter or use a knife to create sticks or squares. • Place on parchment paper lined baking sheet. • Bake 25-35 minutes at 350˚ until crispy and golden. • Cool completely before serving. 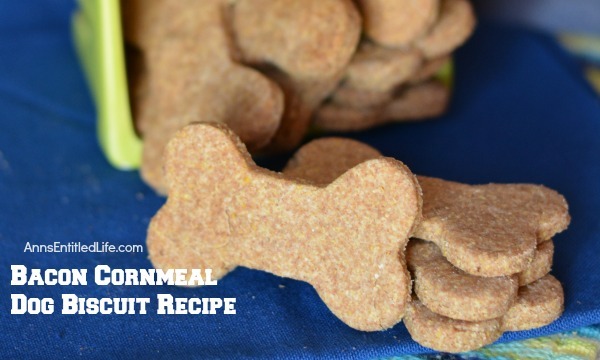 • Make certain your dog is not allergic to whole wheat flour or cornmeal (or bacon grease) before making and serving these. Many white dogs develop “tears”. This is usually (but not always) a wheat allergy. If you are not certain if your dog has allergies, use caution when introducing a new food or treat to your pooch, and consult your dog’s veterinarian. • I listed 12 as the servings, but that will really depend on how large you make your biscuits. A small portion will make many more, a larger portion will make less. It really depends on the size of your dog. • Tip: After making bacon, store the bacon grease in the refrigerator in a covered container until ready to use. 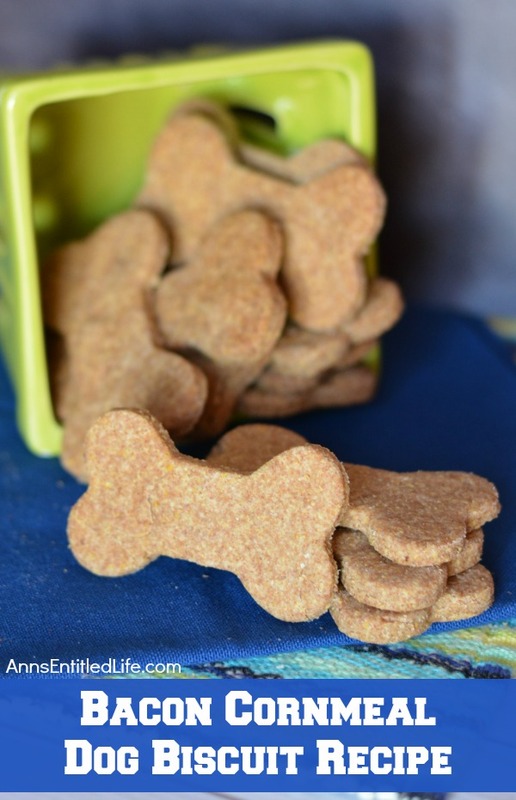 You can probably freeze it as well and make these dog biscuits when they are convenient for you. 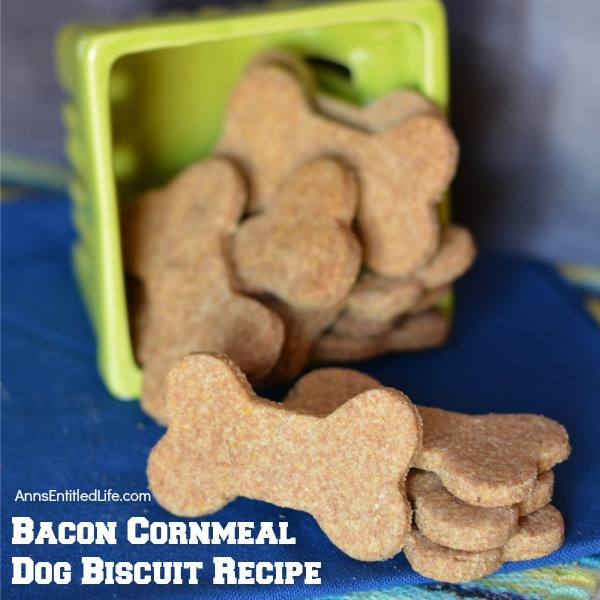 • To print the Bacon Cornmeal Dog Biscuit recipe, click here. Mr. Max can’t have these, Stephanie. The wheat gives him eye boogers (which is nasty). I hope your dogs love them! Mr. Max is all for the bacon grease, believe me! Our fur babies would love these! Thanks for sharing at Merry Monday! Thank you for sharing with Delicious Dishes Recipe Party this week! Hope to see you again for another party tomorrow!